After you’ve created your company page, you’ll probably wonder (repeatedly) how you found it the last time you published to the page. It’s easy to get lost trying to find Google+ Pages and getting to the update screen. When you log in to Google+, it defaults to your personal profile screen to update the service. Any update you make here will be from your personal profile. Click your name. Your name is at the upper right of your news feed — in the “sandbar” at the top of Google+, next to your profile image. 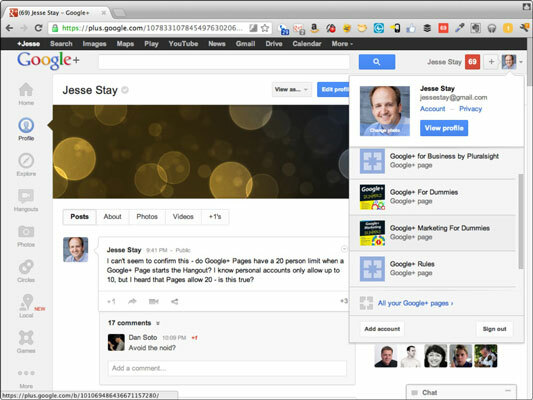 If you click your name, a drop-down menu lists all the Google+ Pages you manage. If you click your Google+ Page there, a new page (or browser tab, depending on your browser settings) offers a page for you to start posting to. Search for the page. This is Google, so when in doubt, search for it. Type the page name in the search box. Your page should come up in the drop-down menu or search results. 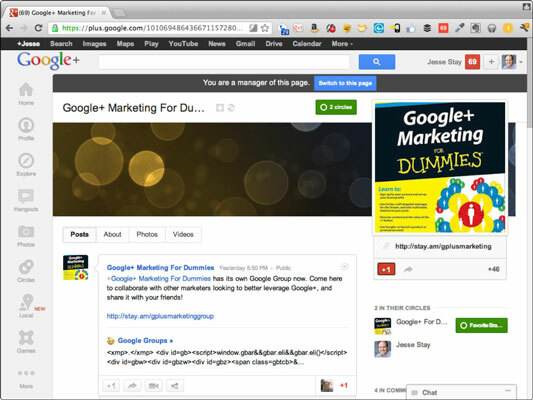 Click the page to go to the Google+ Page you just created. By default, pages you visit (even those you created) appear as though you’re just a visitor. You can’t post to the page. When you comment, it’s posted from your personal profile. If you’re a page admin, a prompt at the top should say Switch to This Page. Click Switch to This Page to go to a new mode. Now you can start posting as the page to your page’s audience. Be careful when you’re in page administration mode; it’s easy to accidentally post as the page when you mean to post as yourself. This can be an even bigger issue if you’re managing a much larger brand page that has multiple admins or needs to maintain its reputation. Imagine if you posted a controversial opinion and you thought you were logged in to your personal profile — when in reality you were posting as the page. People can get fired over such mistakes. If you’re a page admin, always sit on your hands before clicking that Share button. Be absolutely sure you’re posting as the entity you want to be. Click the Pages link in the Google+ Navigation. A Pages icon is in the main navigation area (next to your Home, Profile, Photos, and Circles icons). 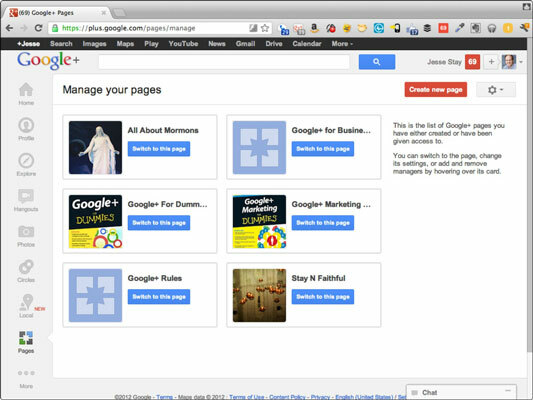 When you click the Pages icon, you’re taken to a list of Google+ Pages you manage. Click any of the pages to go to administrator mode.